Steve dug worms out of the ground to sell to the bait store so he could buy food. Sometimes, shaking with hunger, he jumped over a neighbor's fence and ate green apples off the tree. In school some of the teachers made fun of him because he didn't have school supplies. Yet despite his rough upbringing, he excelled in his studies, and by high school he could play basketball well. After his high school graduation, Steve joined the military and served in the Vietnam War. He earned a college degree in business management and made a successful living working on aircraft. Eventually, though, he felt impressed to attend a Christian school, and he told his friends he was going to Rhema Bible Training College in Broken Arrow. His friends suggested he attend a Christian school in their area, but he knew the Lord had told him to go to Rhema. The message of faith and the teaching on the believer's authority were new to Steve, but he grew in his knowledge and understanding of God's Word. He also learned about the power of confessing that Word over his life. Steve graduated from Rhema in 1986, full of faith and God's Word. And the Lord told him to go to Kansas City, Missouri, and reach people with the message of faith and the Good News. Greatly excited, Steve packed up his belongings and moved his wife and kids to Kansas City. When he arrived, the Lord told him to hold a three-day seminar. He rented a hotel conference room and went door-to-door passing out a thousand flyers to people in the community. During those three days, only one person showed up. "Was this God's plan?" he thought. "Where are the masses of people I am called to reach?" Steve needed to hear from God. Feeling defeated, Steve paid the hotel for the use of the room. He was already short of money and had no job to support his family. In the natural, it looked like he had missed God by coming to Kansas City. With tears he cried, "God, I'm in this city! I don't know anybody, and I know You sent me here. I've got to give these people my last bit of money, because I reserved the room." "Whose money is it?" God asked. "Can I do with My money what I want to do?" From that day on Steve settled in his heart that whatever God put in his hands, it all belonged to Him. His responsibility was to trust and believe and God would be faithful to take care of the rest. That same year Steve founded Harvest Church. He began teaching his congregation the message of faith and their authority in Christ, and he urged them to trust God's plan for their lives. God caused the church to grow. It grew so much that He led Steve to purchase a shopping mall. Steve realized that the Lord's vision to reach Kansas City was bigger than he could grasp. And He was calling Harvest Church to greater works, including reaching "the least of these." Kansas City is Missouri's largest city. There are many restaurants, successful corporations, and entertaining and fun activities. There are also thousands of homeless people sleeping under bridges and in cars or abandoned buildings. Steve's upbringing in stark poverty gave him compassion for these, and he is endeavoring to show them God's love. Through the changing seasons, the homeless, including many families with children, are without food, shelter, and adequate clothing. Harvest Church members go out into the highways and byways to reach them with the Good News. The church's We-Care Center clothes and ministers to those who have nothing. During cold Kansas City winters, Harvest Church members distribute hot sandwiches and soup and provide gloves and coats for warmth. "Some of those people living under bridges are doctors and lawyers and schoolteachers, and they just hit a hard place," shared Steve. Harvest Church is also helping its community through Leah's House, a live-in facility for unwed pregnant teenagers. Steve and his wife, Donna, have a passion for helping these girls during their pregnancy, and also helping them receive an education. They encourage them to keep their babies and not abort them. Steve believes that saving these lives is important to God and His Kingdom. The young mothers live in Leah's House for a year and get their GED. Many young girls have gone through the program, had their lives changed, and received college scholarships to further their education. Steve shared the story of one such young woman. She came to Leah's House, went through the GED program, and received her diploma. Then she applied to a local university and received a full-ride scholarship. Harvest Church also operates Project Destiny, a multi-phase community development program. Project Destiny provides affordable housing, medical facilities, supportive services, educational opportunities, and help for entrepreneurs. As the church reaches out to their community with the Good News, countless lives are being changed. Steve has come a long way from his meager beginnings. But he understands it's not because of anything he has done—it's because of the goodness of God. The faith message has had a tremendous impact on his life, and he is endeavoring to impart that same life-changing message to others. Steve also remembers who has helped him. 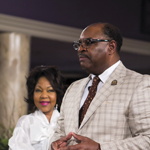 "A lot of the success we have experienced in ministry is because after 1986, we stayed connected to Rhema Bible Training College. We have stayed connected with our finances, even to this day. I don't believe you can stay connected to something great and not produce greatness in your life." TO LEARN MORE about Steve and Donna Houpe, go to SteveHoupeMinistries.org.